A Roman domus was limited in size because of the confines of the city walls. In the older parts of the city the rich could not build out, so they built up. In ancient Rome, the domus (plural domūs, genitive domūs or domī) was the type of house occupied by the upper classes and some wealthy freedmen during the Republican and Imperial eras. It was found in almost all the major cities throughout the Roman territories. The modern English word domestic comes from Latin domesticus, which is derived from the word domus. The word dom in modern Slavic languages means "home" and is a cognate of the Latin word, going back to Proto-Indo-European. Along with a domus in the city, many of the richest families of ancient Rome also owned a separate country house known as a villa. Many chose to live primarily, or even exclusively, in their villas; these homes were generally much grander in scale and on larger acres of land due to more space outside the walled and fortified city. The elite classes of Roman society constructed their residences with elaborate marble decorations, inlaid marble paneling, door jambs and columns as well as expensive paintings and frescoes. Many poor and lower-middle-class Romans lived in crowded, dirty and mostly rundown rental apartments, known as insulae. These multi-level apartment blocks were built as high and tightly together as possible and held far less status and convenience than the private homes of the prosperous. The homes of the early Etruscans (predecessors of the Romans) were simple, even for the wealthy or ruling classes. They were small familiar huts constructed on the axial plan of a central hall with an open skylight. It is believed that the Temple of Vesta was, in form, copied from these early dwellings because the worship of Vesta began in individual homes. The huts were probably made of mud and wood with thatched roofs and a centre opening for the hearth's smoke to escape. This could have been the beginnings of the atrium, which was common in later homes. As Rome became more and more prosperous from trade and conquest, the homes of the wealthy increased in both size and luxury, emulating both the Etruscan atrium house and Hellenistic peristyle house. The domus included multiple rooms, indoor courtyards, gardens and beautifully painted walls that were elaborately laid out. The vestibulum (entrance hall) led into a large central hall: the atrium, which was the focal point of the domus and contained a statue of or an altar to the household gods. 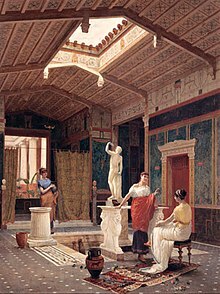 Leading off the atrium were cubicula (bedrooms), a dining room triclinium where guests could eat dinner whilst reclining on couches, a tablinum (living room or study), and the culina (Roman kitchen). On the outside, and without any internal connection to the atrium, were tabernae (shops facing the street). In cities throughout the Roman Empire, wealthy homeowners lived in buildings with few exterior windows. Glass windows were not readily available: glass production was in its infancy. Thus a wealthy Roman citizen lived in a large house separated into two parts, and linked together through the tablinum or study or by a small passageway. To protect the family from intruders, it would not face the streets, only its entrance providing more room for living spaces and gardens behind. Surrounding the atrium were arranged the master's family’s main rooms: the small cubicula or bedrooms, the tablinum, which served as a living room or study, and the triclinium, or dining-room. Roman homes were like Greek homes. Only two objects were present in the atrium of Caecilius in Pompeii: a small bronze box that stored precious family items and the lararium, a small shrine to the household gods, the Lares. In the master bedroom was a small wooden bed and couch which usually consisted of some slight padding. As the domus developed, the tablinum took on a role similar to that of the study. In each of the other bedrooms there was usually just a bed. The triclinium had three couches surrounding a table. The triclinium often was similar in size to the master bedroom. The study was used as a passageway. If the master of the house was a banker or merchant, the study often was larger because of the greater need for materials. Roman houses lay on an axis, so that a visitor was provided with a view through the fauces, atrium, and tablinum to the peristyle. A schematic of a domus. Vestibulum (Fauces) The vestibulum was the main entrance hall of the Roman domus. It is usually seen only in grander structures; however, many urban homes had shops or rental space directly off the streets with the front door between. The vestibulum would run the length of these front Tabernae shops. This created security by keeping the main portion of the domus off the street. In homes that did not have spaces for let in front, either rooms or a closed area would still be separated by a separate vestibulum. Atrium (plural atria) The atrium was the most important part of the house, where guests and dependents (clientes) were greeted. The atrium was open in the centre, surrounded at least in part by high-ceilinged porticoes that often contained only sparse furnishings to give the effect of a large space. In the centre was a square roof opening called the compluvium in which rainwater could come, draining inwards from the slanted tiled roof. Directly below the compluvium was the impluvium. Impluvium An impluvium was basically a drain pool, a shallow rectangular sunken portion of the Atrium to gather rainwater, which drained into an underground cistern. The impluvium was often lined with marble, and around which usually was a floor of small mosaic. Fauces These were similar in design and function of the vestibulum but were found deeper into the domus. Separated by the length of another room, entry to a different portion of the residence was accessed by these passageways which would now be called halls or hallways. Tablinum Between the atrium and the peristyle was the tablinum, an office of sorts for the dominus, who would receive his clients for the morning salutatio. The dominus was able to command the house visually from this vantage point as the head of the social authority of the paterfamilias. Triclinium The Roman dining room. The area had three couches, klinai, on three sides of a low square table. Alae The open rooms (or alcoves) on each side of the atrium. Ancestral death masks, or imagines, were displayed here. Cubiculum Bedroom. The floor mosaics of the cubiculum often marked out a rectangle where the bed should be placed. Culina The kitchen in a Roman house. The culina was dark, and the smoke from the cooking fires filled the room as the best ventilation available in Roman times was a hole in the ceiling (the domestic chimney would not be invented until the 12th century CE). This is where slaves prepared food for their masters and guests in Roman times. Posticum A servants' entrance also used by family members wanting to leave the house unobserved. The back part of the house was centred on the peristyle much as the front centred on the atrium. The peristylium was a small garden often surrounded by a columned passage, the model of the medieval cloister. Surrounding the peristyle were the bathrooms, kitchen and summer triclinium. The kitchen was usually a very small room with a small masonry counter wood-burning stove. The wealthy had a slave who worked as a cook and spent nearly all his or her time in the kitchen. During a hot summer day the family ate their meals in the summer triclinium to stave off the heat. Most of the light came from the compluvium and the open peristylium. There were no clearly defined separate spaces for slaves or for women. 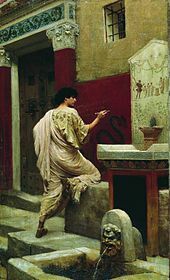 Slaves were ubiquitous in a Roman household and slept outside their masters' doors at night; women used the atrium and other spaces to work once the men had left for the forum. There was also no clear distinction between rooms meant solely for private use and public rooms, as any private room could be opened to guests at a moment's notice. Ostium, The entrance to the domus. Compluvium, The roof over atrium which was purposely slanted to drain rain water into the impluvium pool. This was generally sloped inwards but many designs have the roofs sloping the opposite direction away from the centre opening. Much of what is known about the Roman Domus comes from excavations at Pompeii and Herculaneum. While there are excavations of homes in the city of Rome, none of them retained the original integrity of the structures. The homes of Rome are mostly bare foundations, converted churches or other community buildings. The most famous of the Roman domus is the Domus of Livia and Augustus. Little of the original architecture survives; only a single multi level section of the vast complex remains. Even in its original state, however, the House of Livia and Augustus is not a good representation of a typical domus, as the home belonged to one of Rome's most powerful, wealthy and influential citizens. In contrast, homes in Pompeii were preserved intact exactly as they were when they were occupied by Roman people 2000 years ago. The rooms of the Pompeian domus were often painted in one of four styles: the first style imitated ashlar masonry, the second style represented public architecture, the third style focused on mystical creatures, and the fourth style combined the architecture and mythical creatures of the second and third styles. The concept of legal abode such as "Domicilium" or today's usage "Domicile" is a documented and legal standard, common in Western society for thousands of years. An early reference to domicilium is found in the Lex Plautia Papiria, a Roman plebiscite enacted in 89 BC. Under this law, Italian communities that had previously been denied could now gain citizenship. Wikimedia Commons has media related to Domus. ^ Frazer, Alfred (1998). The Roman villa. University of Pennsylvania Museum Publication. p. 64. ISBN 978-0-924171-59-8. ^ Aldrete, Gregory S. (2004). Daily life in the Roman city. Greenwood Press. p. 75. ISBN 978-0-313-33174-9. ^ "Domus". LacusCurtius Educational Resource: a Selection of Articles from A 19th-Century Classical Encyclopaedia. Retrieved 2009-04-28. ^ Rawson, Australian National University, Beryl (1987). The Family in Ancient Rome. Cornell University Press. p. 128. ISBN 978-0-8014-9460-4. ^ Schoenauer, Norbert (1981). 6,000 years of housing. W. W. Norton & Company; 3 Rev Exp edition. p. 136. ISBN 978-0-393-73052-4. ^ Treggiari, Susan (2001). Roman social history. Routledge. p. 79. ISBN 978-0-415-19522-5. ^ "Domicilium". LacusCurtius Educational Resource: a Selection of Articles from a 19th-Century Classical Encyclopaedia. Retrieved 2009-04-29. This page was last edited on 22 March 2019, at 10:06 (UTC).